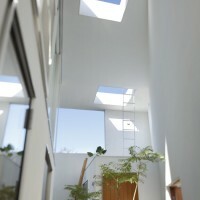 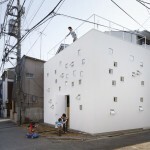 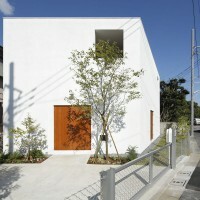 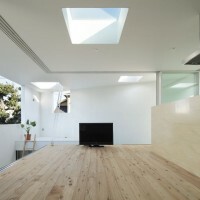 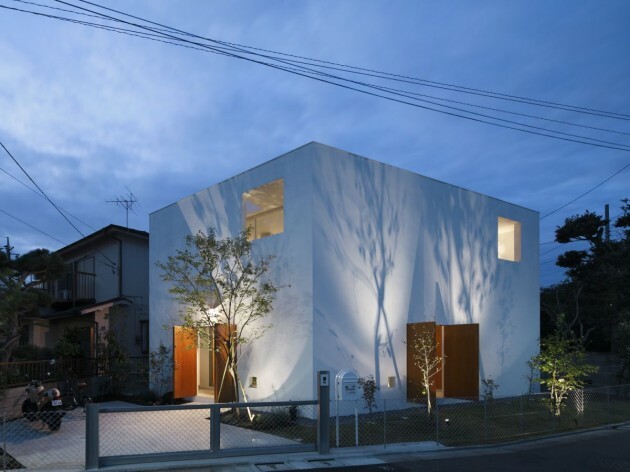 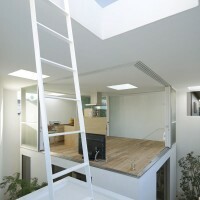 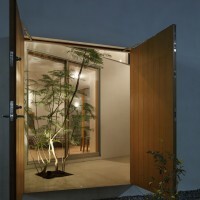 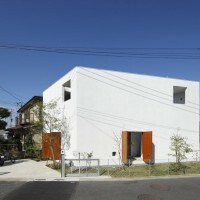 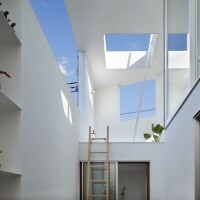 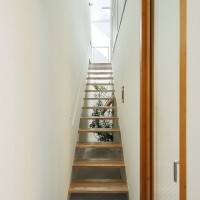 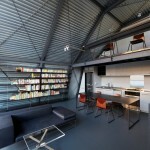 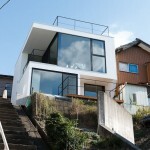 Takeshi Hosaka Architects have designed the Inside Out house in Tokyo, Japan. 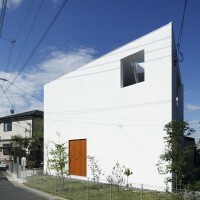 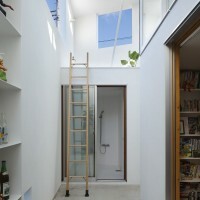 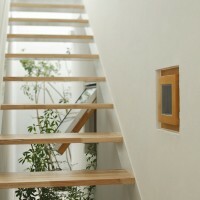 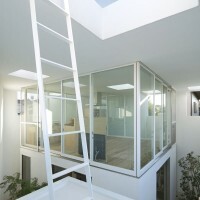 This is a project of a house for a married couple and two cats, located in Tokyo. 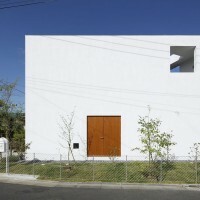 The shape of the building was decided as an irregular quadrangle in accordance with the irregularly-shaped quadrangular site. 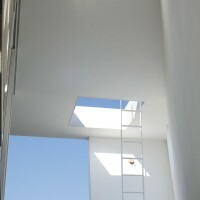 The roof and wall sides of the volume have carefully designed openings, through which light, wind or rain could enter into the building. 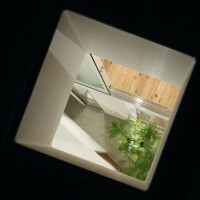 Plants are planted in the ground under the roof opening which allows rain to enter in. 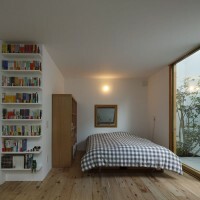 The boxes for bedroom and for bathroom are put in the outer volume; and a living room is located above the bedroom box and a deck above the bathroom box. 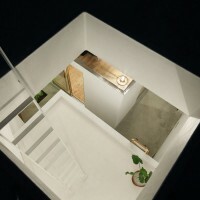 Inside the volume, there is a space in which you would feel yourself being outside: Light, wind or rain could enter in, so that your way of living depends on the weather; but in this house, you would always positively seek to find another images of life. 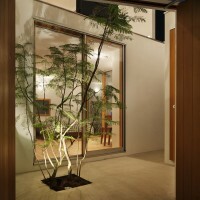 Areas on the floor on which rain falls vary according to the wind direction, so you would seek to find the area where you don’t get wet. 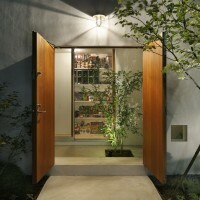 As you live longer, you would find out, from your experiences, various things about the relation between the extent to which rain enters in on the one hand, and the location of objects, furniture and yourself on the other. 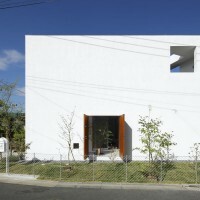 And, there is no air-conditioner in this house. 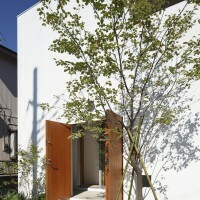 During intermediate seasons or summer, both humans and cats live in natural draft, or, in the other words, they live in the air environment which is almost same as the outside. 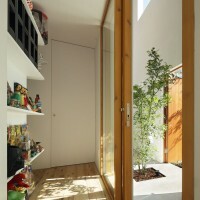 On windy or chilly days, you could stay in the indoor boxes or the living room with glass sliding doors closed. 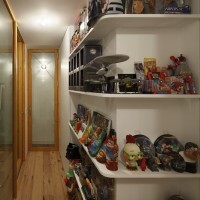 Figures and other many items which had been collected are located not only indoors, but many of which are also put on the outdoor shelves to the extent that it is possible. 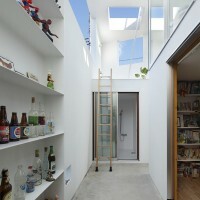 Cats walk on the thin line on which rain doesn’t fall and find places in the sun to take a nap. 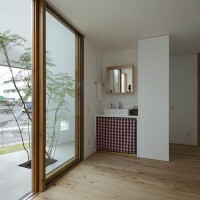 The couple stay in the living room upstairs with glass doors open, sometimes even on rainy days; they often live a life in which they feel themselves being outside even while being inside. 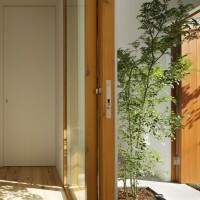 People living in the modern era attempt in the modern way to reduce energy consumption and to coexist with nature — this is also a positive attempt to find what ways of life are possible beyond energy problems and this, in turn, beyond way of life, leading to the important themes about human mental activities. 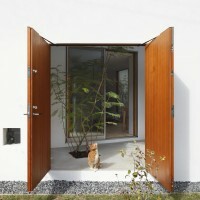 The couple and cats who had lived in an apartment are now pioneering the new images of life every day in the weather-dependent house inside which they feel being outside. 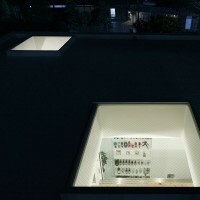 Visit the website of Takeshi Hosaka Architects – here. 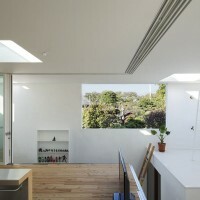 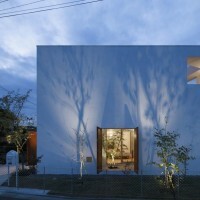 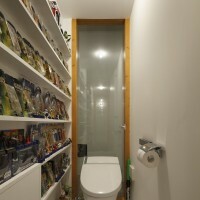 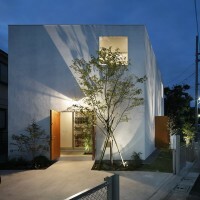 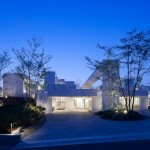 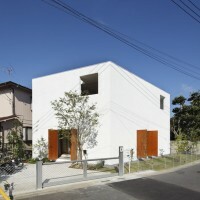 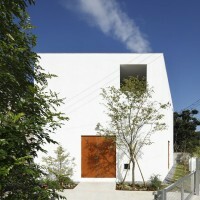 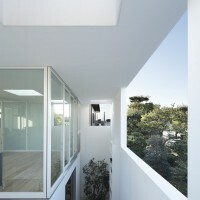 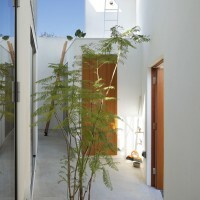 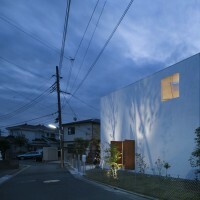 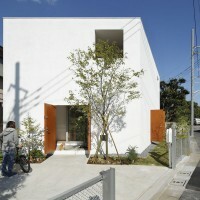 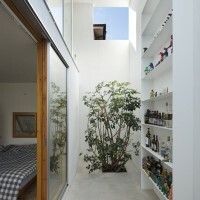 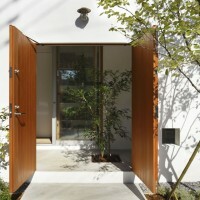 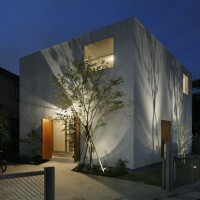 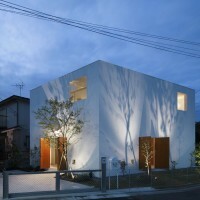 Photography by KOJI FUJII / Nacasa&Pertners Inc.